Unconcerned with the notorious mechanical irregularities that guarantee the questionability of any election results in this country, Hollywood has nonetheless produced a powerful statement with the film Swing Vote. The high-budget, cardinal point is that every vote counts. Another point is that, as John Adams stated, we must all remain educated so that our electoral decisions will be carefully thought out and consistent with our ideals and aspirations. A further strong point is the utter hypocrisy of the political process, and the voting integrity movement is thrown a morsel when, at the beginning of the film, the Republican operative orders the deployment of several tall blonds to harass some Democratic voters trying to exercise their democratic rights. Kevin Costner plays a middle-aged Joe Six Pack down on his luck, in the custody of his precocious daughter, played by Madeline Carroll, who rules the action from beginning to end, pulling her father out of bed to go to work and take her to school in the morning and, by the end of the film, educating him to moderate a presidential debate held exclusively to win his vote ten days after Election Day. The whole world, the whole press, is focused on a tiny, deadbeat town in New Mexico, and beyond that on the vote of Costner, which will determine the outcome of a presidential election stalled at a dead tie. The future of the world boils down to one "below average," as he describes himself, unemployed loser. Why a single vote ten days after Election Day? Molly attempted to get him to vote and when he doesn't show, she sneaks in to vote for him, but a custodian disconnects the touchscreen machine while she is voting, so she must sneak out without accomplishing her goal, except that she has the stub of the card used to initiate the voting process. That ultimately identifies "Bud" as The voter; the movie turns to us and demands that no one ever consider his or her vote useless again. There is comedy, satire, and pathos as the American public showers the highly publicized Bud with problems that would sink an Atlas: Why, in the richest nation in the world, are people working multiple jobs and still living in poverty, unable to afford medical care for their families? Just as the world focuses in on Bud, so, at the presidential debate held in his honor, he focuses in on one letter that expresses such anguish. Ultimately Bud justifies this nudge from the world to put on a suit and give life a chance, though it is hard to believe that in one night a man with a fifth-grade education, even tutored by several experts, can all of a sudden become the outspoken Democrat he has been, deep down, all of his adult life. Casual remarks here and there throughout the film corroborate this logical affiliation. Presumably, at the end of the film, life will come together and treat Bud like a man rather than a cracker. A cast including a host of media celebrities such as Chris Matthews, Arianna Huffington, Larry King, and James Carville helps comprise this mammoth alarm clock. Nathan Lane and Kelsey Grammer play effective supporting roles, among other luminaries. Molly remains alarmingly sane throughout, her father's parent, seeing through the bribery and manipulation, values intact-ruling the action, an individual smarter than the president, by his own admission. When 55 percent of the country will vote on optical scanners this November, and when New Mexico is known to have switched over to optical scanners statewide several years ago, the movie loses some credibility. Moreover, the portrayal of the underbelly of politics is far too kind even when stood on its head. Both candidates remain likeable, on first-name terms with Bud who, as his real name is revealed toward the end of the film slips into this new mode, himself, at least for the time being and presumably longer, Ernest. 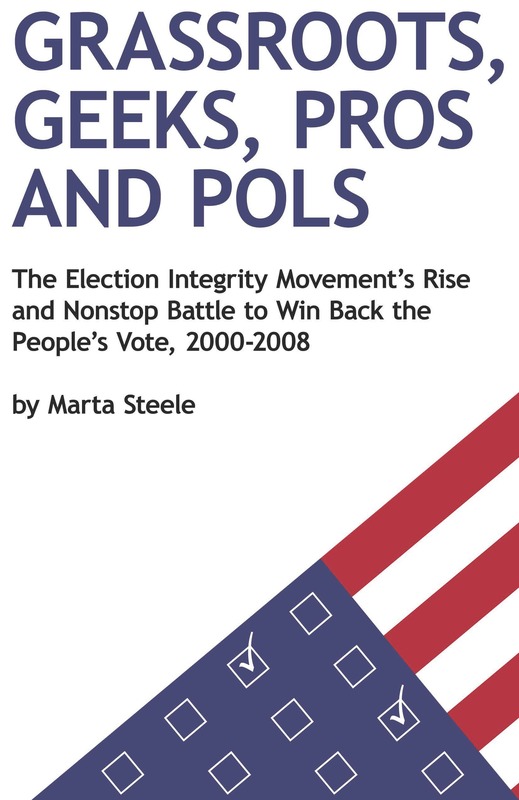 View All 96 Articles in "Election Integrity"
View All 88 Articles in "Reviews"
Review: Andrew Kreig, "Presidential Puppetry: Obama, Romney, and Their Masters"
Smart Security or Dumb Dollar$? "In his groundbreaking new book Bottom Up: Tapping the Power of the Connection Revolution, Rob Kall invites and eases us into in a much-needed meta-level shift -- a truly basic paradigmatic shift from top-down to bottom-up. He capably and imaginatively explores the differences between these ways of approaching life, clearly demonstrating that bottom-up allows us to flourish. His vision and his book are enriched by telling references to interviews which he has engaged in over the years with bottom-up researchers, theorists, activists, and dreamers in a variety of areas. Think about Rob's interviews. Read this revolutionary book. And take one step further into the bottom-up universe yourself. You will not regret it."